The beautiful 2nd hole; a tempting, short Par 4. Golf courses rarely turn out exactly as the architect would have chosen. Environmental concerns often hinder their plan and, unless the developer is a Las Vegas casino that wants a lush oasis in the middle of the Nevada desert, or goes by the name of Trump, budgetary restrictions will usually be lurking. Then there’s the small matter of ownership. This is not the architect’s land to dig up as he pleases, nor will the course be his to play whenever he likes. It is a business, paid for by a developer who will most likely be looking to attract as many golfers as possible, and who will invariably want to contribute his two cents during the design process. 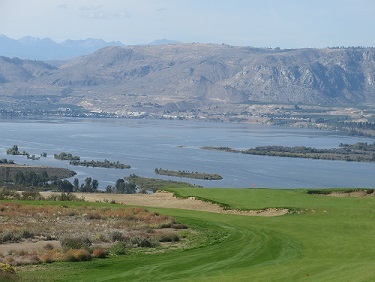 For starters, the course overlooks the mighty Columbia River and was built on sand - lots of it. “It’s about a 275-acre parcel, and the sand goes down for 300ft,” says Kidd. Anyone who plays golf, or builds golf courses for a living knows sand is the magic ingredient as it improves drainage and promotes firmer, healthier, lower-maintenance turf that is more enjoyable to play on than turf that is soft and soggy. A complex, expensive irrigation system wasn’t necessary, and because the terrain possessed ample undulation, variety, and interest, there was no need to bulldoze it. Gamble Sands therefore ended up costing significantly less to build than Bandon Dunes, Kidd’s first American design. The client was Gebbers Farms (potato farmer John Gebbers married Martha Gamble, daughter of pioneering orchardier Dan Gamble, in 1927 – hence the ‘Gamble’), one of Central Washington’s biggest fruit producers, harvesting almost 250,000 boxes of apples and cherries a week, 52 weeks of the year. Because they are non-golfers, the family built the course primarily to stimulate the local economy and give Brewster residents, many of whom grow up wanting to move to the big city – Seattle is 200 miles west, Spokane 140 miles east - a landmark of which they could be proud. Locals will pay reduced green fees, and the staff will come from the immediate area. OB Sports will operate the course which Kidd describes as a ‘sort of Sand Hills for the public’. There are several great holes, and those that aren’t great are merely very good. The emphasis is on fun and playability with generous fairways, and banks that are shaved to ease the ball’s path toward the hole, or kept long to prevent it from running into something nasty. Don’t run away with the idea it’s easy though; there are plenty of holes you can double-bogey if you’re not thinking straight. The greens were sown with a mix of fescue and colonial bent and those that were seeded first, just six weeks ago, are already putting superbly. The fun is scheduled to begin in August 2014 by which time the clubhouse, modeled on a Bend, Ore. brewery will have been built. A handful of memberships will be available, but the bulk of the anticipated 20,000-22,000 rounds a year will come from the public. Green fees have not yet been decided, but early rumors suggest they will top out at $150.